Another killer busy day and no time for a proper blog post but I thought I would show you two more entries to John's flower show veggies exhibition. 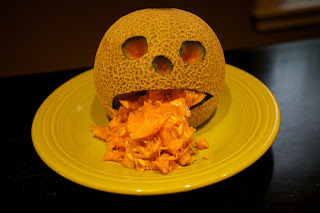 A zombie melon. And me and my snowman. I thought it was a possessed melon, needing exorcism. Gosh I'm getting into a Halloween mood! gracie will love that zombie!!! Love the first melon. Very zombie like. The Trelawnyd Flower Show is turning you into a real artiste! John will LOVE the Zombie, Joyce!! 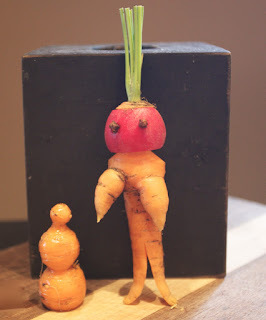 I LOVE the carrot radish dude :)!